How to convert home Videos to Flash SWF and FLV? Home video formats like AVI, MPEG, WMV and MOV are not suitable for online sharing and viewing. In contrast, Flash video and SWF video are widely used in product display which is smaller in size and more convenient for transmission over the Internet. FLV or Flash Video is a brand-new stream media format which utilizes the Flash Player widely used on the webpage and can integrate the video into the Flash animation. It has higher compression rate, better quality and faster downloading speed. SWF (Adobe Flash or Flash movie ) is also an another typical interactive video format online which you can make as the FLV player embedded in an HTML page thus the viewers have no need to download other players to watch the video created by you. FLV or SWF can be created from nearly all types of video formats, such as DVD, MPEG, AVI, MPG, WMV, RM, RMVB, MOV, ASF and MP4,etc. Therefore, In order to post your favorite videos onto your commercial website, your personal blog and BBS to share with others, you need to convert the videos into Flash format first. But by what means shall you convert the video formats such as AVI, MPEG, WMV in to a totally different format? The answer is that you need a Flash conversion tool. 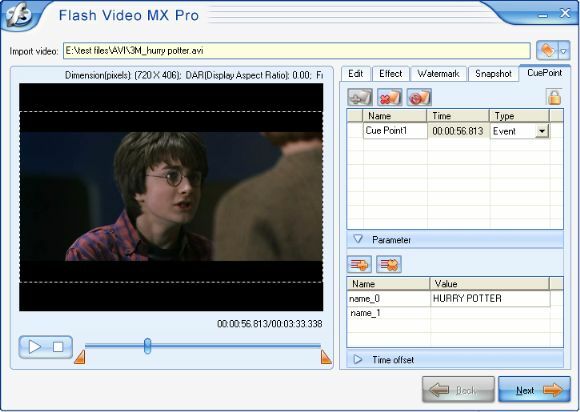 Moyea Flash Video MX Pro is a professional conversion tool to convert video to FLV and Adobe Flash (SWF) for sharing and promoting over the Internet which can perfectly decode the common video formats and encode them in to FLV. 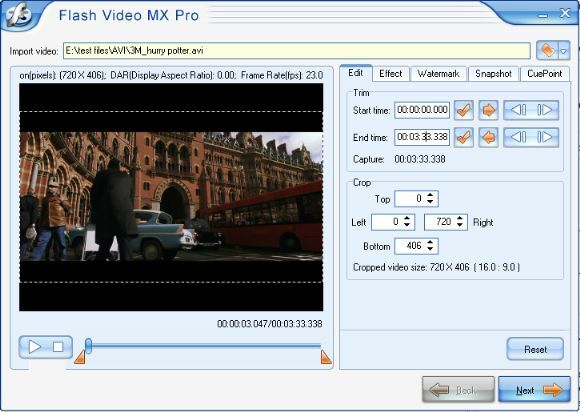 Please download the program at Flash Video MX Pro Download Page to experience its extraordinarily wonderful function first. Click "Folder" and input the video in. This converter can convert videos in various formats like AVI, MPEG, MP3, WMV, ASF, etc. 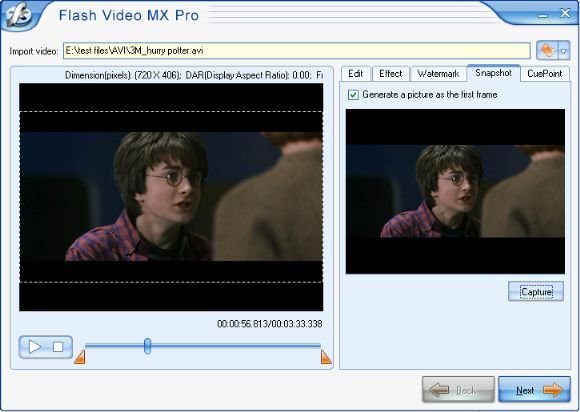 Flash Video MX also can convert Apple Quicktime video to Flash. On the Edit tab, you can trim the video duration, and crop the video content to save part from the video. The following parts illustrate the detail information. In the Trim section, the trim function helps to trim the video duration, and this is probably the easiest way to establish precise control of your clip timing. 1. Enter the time where you want the video clip to start in the Start Time area. Click the button to confirm the start time and end time. Alternatively, it is easier to trim the video during playing. You can also click the button to the frame where you want the video clip to start or end. 2. You can even drag the line under the left preview window to select part of the video quickly. 3.The video duration time will be displayed in the Capture area. In the Crop section, you can crop the video content to save part from the video. 1. In the left panel, use the video preview selector-dragging the slider controls to crop the video. 2. Alternatively enter values in the spin controls for the right, left, top, and bottom edges to crop the video. The cropped information will appear in the bottom of the pane, such as video size, aspect ratio. The Effect tab contains some options that can be used to adjust the video effects. 1. In the Video section, drag the Contrast slider to adjust the contrast. 2. Drag the Brightness slider to correct for any changes in exposure. 3. By checking the Flip box, you can flip the video vertically. 4. The Deinterlace option helps to eliminate the interlace artifacts to get better viewing effects. On the watermark tab, there are options to add image watermark, and text to the video. When the video plays to the point that you want to add image or text, please click the .button. Then select the Add Image or Add Text in the drop-down list. Click the "Transparency" button and you will open a pop-up. 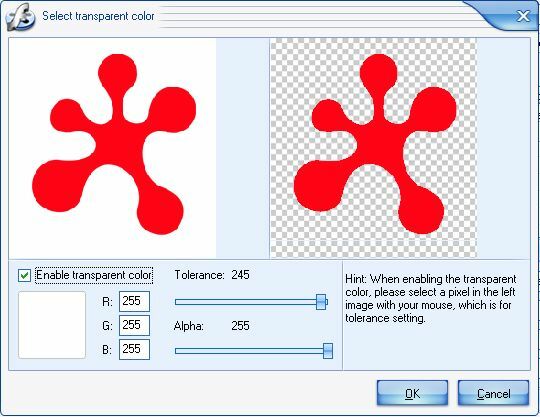 Click your mouse on the left picture to select a transparent color. Drag Tolerance slide bar to adjust the tolerance. and drag the Alpha slider to adjust the alpha attribute. Click OK to return to the logo setting. add. To change the font, click the button , and then the Select Font dialog will appear. From the drop-down menus of Font, Style, Size and Color, select what you need. The Snapshot tab provides the function of capturing a picture from the video for the first frame of the output video. The Capture button helps you to capture any frame of the video as a thumbnail. add cue point, click the button to add a cue point and the button to delete the chosen cue point. In the first list, you can rename the cue point and select the cue point type. There are two types of cue points you get: navigation, event. 1. Click the button to set the parameters for the selected cue point. 2.Set the name and value for parameters in the second list. By clicking the button, you can delete the parameter. How to convert VCD MPEG to Flash for upload on your website? | How to add animated watermark to video?